So many things have happened in the last few years with Operation Meatball. Even when we try and keep tight records on all that goes on, some things still slip through the cracks. However, there is one afternoon that will always be as clear as the day it happened: September 23, 2014. The date's easy to remember... it was the day before my 18th birthday, but even more significantly, it was our very first experience greeting Honor Flights at the WW2 Memorial. Our very first flight was Greater Peoria Honor Flight (GPHF). And our very first veteran was Bob Lake. Our first meeting back in 2014. Immediately following GPHF's program at the Memorial, we met Mr. Lake. He told us that he had turned 18 the day the Japanese surrendered, August 14, 1945. What a day!! For his trip to DC, he had brought with him a newspaper clipping of a cousin who died overseas during the Korea War. When we left him at the memorial, we thought that was goodbye. But after the trip, we sent him a few photos and a note through the GPHF headquarters, and shortly after we were surprised (and pleased as punch!) to receive a card from him. Over the next three years, we exchanged letters, keeping up on each others lives. A year after our meeting, his beautiful wife, Jeanette passed away just shy of their 65th anniversary. But he kept going, and we were happy to see his face periodically in the Honor Flight Welcome Home photos. With all this background, coming to Peoria meant a visit with Mr. Lake was a must! And such a delightful visit it was. In today's world of social media: email over letters, texting over phone calls, coffee dates over house calls, it's a pretty special thing to be brought into someone's home. It's personal. Holding a bottle of dirt from the "Dust Bowl." For several hours, we poured over pictures as Mr. Lake told us stories of growing up in Kansas during the Great Depression, followed by the lesser known (but still infamous) Dust Bowl or "The Dirty Thirties." A period in the mid-1930s when the ever-growing, over-worked farmland of the mid-west revolted and covered several states in literal Dust Storms. And there was no escaping. Mr. Lake described several times when he and his brothers were surrounded by the choking dust winds without any warning. A nearby barn saved them, but it was miserable. After these storms passed, everything in sight would be covered in dry dust. The poorly insulated houses were no exception. Tables, chairs, beds, food, rugs, everything was covered. The severity and destruction of these storms eventually caused Mr. Lake's father to take his family and move back to Illinois. But not before collecting a bottle of this ruinous dust. I couldn't have been happier to see Mr. Lake again after these last few years. It was like our whole experience with Honor Flight came full circle. Our first experience with Honor Flight, a brief meeting at the WW2 Memorial, long-distance friends, and finally back together. We are so looking forward to many more years of happy friendship with this wonderful man. A real highlight for us during our time in Peoria was getting to attend a special weekly breakfast get-together of WWII, Korea, and Vietnam veterans from Greater Peoria Honor Flight. And what a treat it was! Whenever you have the opportunity to sit at a table of men who served our country, it is an honor and an unforgettable experience. The very merry group who gathered around the tables this morning were the same fellas who came in by storm the day before and had left everyone holding their sides in laughter and hilarity. I was delighted to find a seat down at one end of the table next to none other than Abbot and Costello 2.0 a.k.a Harold and Barney, the two life-long friends. We chatted, laughed, and I listened to stories of their escapades and adventures in the local circus. Barney: "Do you know Stinky?" Me: (laughing) "I don't think so. Where does he live?" Barney: "Have you ever heard of Seagoville, Texas?" We looked up the town and find it right next to Gun Barrel City, another town I'd never heard of. They both ended up living in the suburbs of the Dallas suburbs. Yes, that's really what they told me. After all, 100 miles away is still the suburbs, right? Harold: "Yup. That's where he lives." Barney: "If you ever go up there, give him a call. Tell him I say hello." Harold: "Better not. He'll probably hang up on you when he hears Barney's name." So much laughter later, we got around to talking about Harold's service in the Marine Corps. Mr. Berg in fact is one of the very last of the elite Marine Corps Raiders. In a sense, the Raiders were the precursor to the US Special Ops Forces. Their job was tough and called for an even tougher type of guy. I've only had the opportunity to meet one other Raider, Bert Stolier of the WWII Museum. He participated in some of the hardest fought battles of the Pacific including Guadalcanal, Tarawa, and Iwo Jima. For Mr. Berg, his time as a Raider was none the less hard. He participated in the fighting at Guadalcanal, Guam (where he was bayonetted in the leg by a Japanese soldier they had presumed dead), Saipan, Bouganville and New Georgia. Later, he received injuries in the face, shoulder, chest, and hand by an enemy grenade. Fighting on Okinawa was brutal, losing all 12 men in his squad. That he survived at all is truly a miracle. Nearly 92 (in fact we practically share a birthday... just separated by one day and a few years), he is still as plucky a fellow as ever. He told me that within a few days following our visit he would be returning to the Guadalcanal for a special memorial service he would be presiding over. We are a blessed country indeed to have such men as Harold Berg willing to serve, whether it is as a teenager on the battlefields of the Pacific, or as a nonagenarian willing to make the extremely arduous journey back to those same battlefields, just so that the memory of our boys and their sacrifice will not be forgotten. The rest of the breakfast went splendidly. With enough time for everyone to finish their meals, Faith pulled her ukulele out and soon both tables were singing merrily along to different war-time favorites. A few eyes got misty on "I'll Walk Alone." Others reminisced during "Somewhere Over the Rainbow." And they all joined in for, "You Are My Sunshine." It was marvelous. Phyllis Piraino and two of GPHF's very wonderful veterans. PC: Greater Peoria Honor Flight. I must take a moment and thank our sweet and amazing friend, Phyllis Piraino, Vice-President of GPHF. Though we had never officially met until this trip, we'd kept in touch over the years since the girls and I first met the Peoria flight in D.C. And honestly, it felt like we had known her forever. Her genuine love for America's veterans, coupled with a tireless enthusiasm (no small potatoes!) for her work with Honor Flight is a rare quality to find. Throughout the week, we were completely inspired by how Phyllis and the fabulous staff of GPHF have worked not only to send veterans to D.C., but also to include and incorporate the entire community of Peoria as well. Giving anyone - from the oldest to the youngest - the opportunity to thank the men who have served out country. And isn't that what makes the whole Honor Flight experience so special for these dear veterans? Our few days in Peoria couldn't have been lovelier, and though we've only been home a short while, we are already planning and scheming ways to get back up there. Thank you Greater Peoria Honor Flight for a superb visit and for sharing your time and veterans with us!! There is so much to tell from our adventures in Illinois. We met so many marvelous individuals, enjoyed some very special moments, and visited dear friends we haven't seen in several years (some of whom we haven't seen since we first started Operation Meatball!). It was truly a fabulous experience. The next few blogposts won't necessarily be in order of events, but you can be sure they will be filled with photos! We arrived in Peoria, Illinois, late Saturday night brimming with excitement about finally getting to see our GPHF (Greater Peoria Honor Flight) friends again after nearly 3 years, and hopefully raising some money to bring veterans to DC. 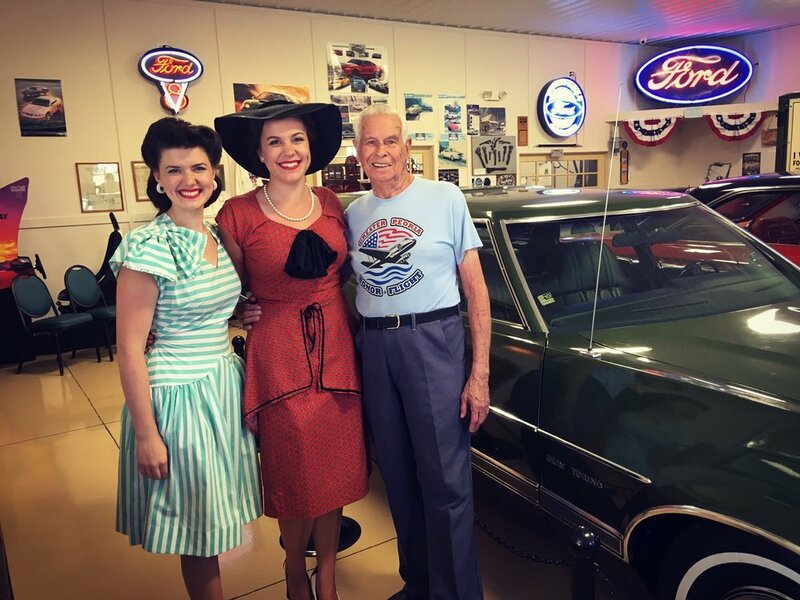 The fundraiser for GPHF was being held at a local museum called "Wheels O' Time." I can hardly think of a more enjoyable venue. Immediately upon entering the main building, we felt as if we had stepped back in time to a scene from the movie "State Fair" (1945) or possibly the boardwalk of Coney Island in the 1930s. Classic cars from the 10s, 20s, 30s, 40s, and 50s filled the center hall. On either side were countless rooms with various amusements such as a presidential barbershop quartet, a vintage grocer's store, a music parlor, reading room, mechanics shop, and much more! 12pm on the dot, veterans and guests started to arrive. One of the jolliest groups of veterans we've ever met arrived and immediately had us all in stitches of laughter. For quite a nice while we chatted and tried to keep everyone's names straight. Some of the banter went like this, "I'm Barney. This is Harold. That's Doc. Watch what you say in front of Doc. He remembers everything." Then Harold would interrupt with, "Don't believe anything Barney says." So Barney would say, "I only tell the truth." Turns out Barney and Harold have been friends since they were school kids. Over 75 years. Talking with the two of them was like watching an Abbot and Costello show. 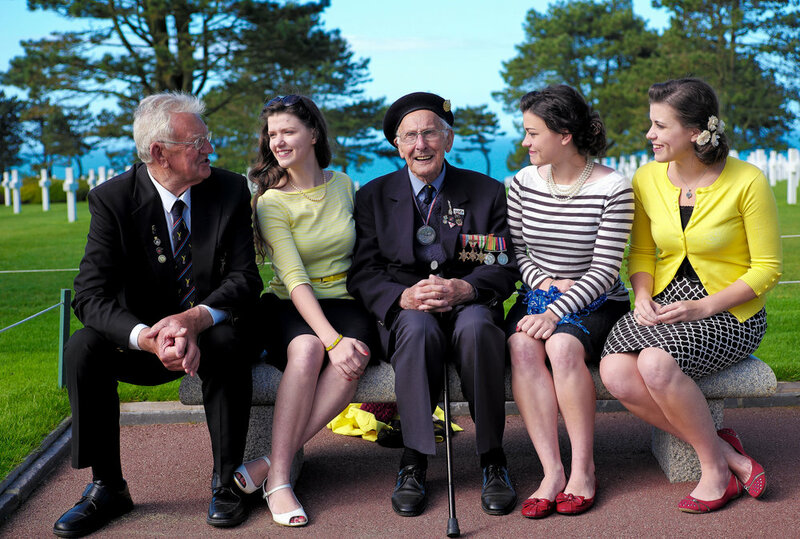 During the war, Harold joined the Marines, while Barney took the Air Corps. I asked them how they chose their respective branches. Barney explained that, in their school programs, the recruiters would periodically come and give presentations on why the young men should enlist, complete with a full (and very dashing) color guard. "I went with the Air Corps. They seemed to think I was a poor flyer so they stuck me in training for 2 years." Barney chuckled. "Harold saw those fancy Marines' uniforms... and he was gone." "No." The Marine Raider said emphatically. "That's not what made me join. I wanted to fight, and the Marines are always first in." "It was the uniform." Said Barney patting his friend on the shoulder. A fun part of the afternoon's program was Faith's singing. For today she had lined up a whole bunch of 30s, 40s, and even a few 50s numbers. Whether she is singing to one person or 50, it's always exciting to watch the audience response. One Korean War veteran (with the best smile!) arrived and asked right away where the singing could be found. I directed him to the upper level "Music Parlor." "When I was in DC," he said, "There were some girls singing and dancing to the "Boogie Woogie Bugle Boy." I wanted to sing it with them but I couldn't remember the words. So I made sure to bring them with me today!" He pulled out of his pocket the lyrics to the Andrew Sister's hit. I ran upstairs and told Faith about her special request. "I don't have the music for it," she said, "But we can play the Andrews Sisters' track and sing-along." The Korean vet was delighted and they proceeded to sing (and dance) the most adorable duet along with the original music. The whole afternoon was just so much fun. It was splendid helping to raise money for one of our very favorite organizations, Honor Flight. Below are just a few more photos. Honor Flight wouldn't get very far without it's wonderful veteran Guardians, Butlers, Valets, or Escorts. Jubilee and Faith are pictured here with one of our friendliest HF guardians, John Myers. We met Mr. Myers back in 2014 and spent quite a while chatting with him and his veteran, Bill Vasen. It was swell getting to see him again after all this time!! Stay tuned for more stories and photos! Our Illinois adventures have begun!!! Three years ago when we first dipped our toes into the infectious waters of Honor Flight, the very first group we met at the WWII Memorial was Greater Peoria Honor Flight. It couldn't have been a better introduction to this wonderful world and dozens of HF's later, it still stands out as one of the most memorable. We made some special friends that afternoon, and ever since we've been quite eager to get up to Illinois for a visit, but despite all our traveling we've never yet made it up to there. So you can imagine then how excited we are to finally be making the trip! The next week is lined up and packed to the brim with veteran visits, the Greater Peoria Honor Flight fundraiser, more veteran visits, and a couple of retirement homes. Depending on how busy things get, we'll try and get a couple of short posts up here.